Courtesy photo Former Piqua police officer Justin Augustine gets processed for a OVI after wrecking his patrol cruiser on Oct. 27. MIAMI COUNTY — A former Piqua police officer was sentenced to probation in Miami County Municipal Court on Wednesday for reduced charges stemming from an incident in which he wrecked a police cruiser while he was impaired on the job. 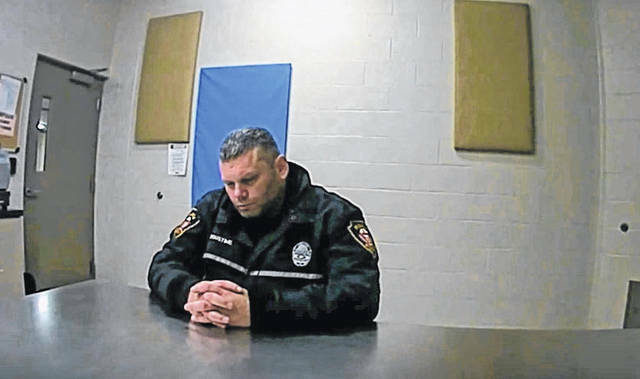 The ex-officer, Justin W. Augustine, 38, of Troy, was found guilty of first-degree misdemeanor weapon under the influence, amended down from fifth-degree felony improper handling of firearms in a motor vehicle, and first-degree misdemeanor physical control of vehicle while under the influence, amended down from an OVI. He was sentenced to serve one year on probation. He also received 177 days of suspended jail time, a $300 fine, and court costs, according to court records. He also received an additional three days in jail, which will be dismissed once he completes an educational program. The case was assigned to the Honorable Thomas M. Hanna, a retired judge of the Kettering Municipal Court. Augustine was originally charged with the weapons charge in November and an OVI charge in late October after he wrecked his patrol cruiser on Oct. 27. Augustine resigned from the Piqua Police Department at the beginning of November. On Oct. 27, at approximately 7:30 p.m., Augustine self-reported a crash on private property to his supervisor. The crash took place in the rear parking lot of the former Piqua Board of Education office at 719 E. Ash St. Augustine reportedly struck a flatbed semi-trailer loaded with concrete barriers used to separate lanes in road construction areas. The trailer had damage to a light fixture on the front right corner, and Augustine’s patrol cruiser had significant damage to the passenger side of the vehicle. An officer observed that Augustine’s eyes “were bloodshot and red and that his speech was slow and slurred,” according to Piqua police reports. A Four Loko Gold 14 percent alcohol per volume malt beverage can was later located in the driver’s door of Augustine’s personal vehicle. An empty can of the same beverage was also found near the crash scene. Augustine refused all drug and alcohol tests after the incident. An additional citation of operating a vehicle without being in reasonable control of the vehicle was dismissed. https://www.dailycall.com/wp-content/uploads/sites/30/2018/12/web1_PO-Justin-Augustine-being-processed-for-OVI.jpgCourtesy photo Former Piqua police officer Justin Augustine gets processed for a OVI after wrecking his patrol cruiser on Oct. 27.